A lot has been said about Sydney property investors in recent years, mostly in derogatory terms. Commentators usually criticise their financial irresponsibility, or even sheer madness, for “piling into the residential property market with excessive leverage” - something which is said to inevitably end badly for each and every one of them. But are these opinions justified? The Australian Taxation Office (ATO) data summary of 2013-14 individual tax returns for postcodes, the latest available, paints a surprisingly different picture. In particular, it is true that property investment is quite popular amongst Sydneysiders. This is clearly illustrated on the following map - purple shaded polygons mark postcodes with the above average proportions of property investors amongst the residents, comparing to figures for Australia as the whole. However, the big surprise revealed in the ATO data is that a significant proportion of Sydney-based property investors are actually netting hard cash from renting out residential properties. That is, their residential property portfolios are not negatively geared at all! 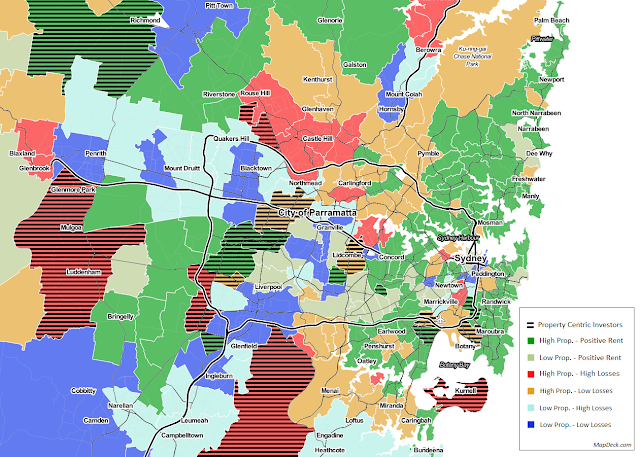 The following map points out postcodes in the Greater Sydney area with a positive average net rental income per investor. There are quite a few of them. So, it turns out, Sydney-based property investors are not leveraged to the hilt en masse as is commonly assumed. There are actually only a handful of postcodes in Greater Sydney with residents who very aggressively gear their investment property portfolios. That is, postcodes which have above average proportions of property investors, and where residents report rental losses at above the national average level. These are marked on the following map as areas with red background. And of those, there are only six postcodes where 6,268 property investors (out of the total of 2,672,004 taxpayers counted in the Greater Sydney area) potentially fit the common stereotype of a property speculator. That is, property investors residing in these postcodes invest in rental properties in above average proportions comparing to the national average and have no or very limited other investments (i.e. are categorised as “Property Centric” investors). AND, at the same time, they are also highly leveraged (i.e. report above average rental losses to the ATO). These are postcodes 2745, 2768, 2769, 2171, 2173 and 2231 - marked on the map as red polygons with black horizontal stripes. Concluding, it is very unlikely that things have changed dramatically in the last two and a half years. So claims of irresponsible, mass scale residential property speculation by Sydneysiders are rather exaggerated. In fact, it appears that quite the opposite is true. Only aggregated data is available for analysis, nevertheless, it suggests that large proportions of Sydney-based taxpayers are playing very safely with residential property investments and are generally diversified into several investment classes, including shares, cash and equivalent. A full set of ATO statistics for postcodes, with extended investor profile information, has been published by MapDeck.com and is accessible online. MapDeck empowers individuals and organisations to make better choices and more informed decisions. By providing easy access to a wealth of statistical information and simple to use location intelligence tools we help our clients in reaching their goals sooner, succeeding faster and on a grander scale. Invitation code: c3df6244 for a free service. The third map is very interesting, shows up some well known property speculation hotspots - the Hills district (about to be connected to Metro rail), the area around the proposed Badgery's Creek airport. Also some areas where overdevelopment of apartments has been occurring (e.g. Alexandria). Established high priced markets along the beach appear to be safe - there has been very low growth in the number of of rentals (even declining) in these areas as some owners have switched to using them as short stays (e.g. AirBnb). More concerning is the loss making middle ring. Questionable whether rents will be able to keep up with the price growth in these areas, especially given the amount of new construction going on.